Beauty Costs > How Much Do Pant Alterations Cost? How Much Do Pant Alterations Cost? Pant alteration is the process of modifying the size and fit or sometimes the appearance of your pants using various sewing methods. By performing these alterations, the pants are guaranteed to be a perfect fit based on your requests. The cost of hemming your pants will depend on the tailor, the type of job being done and your geographical location. Most jobs will be less than $25. Altering and/or replacing the pant zippers, for instance, can cost anywhere from $10 to $25, while regular hem jobs can often cost anywhere from $8 to $25. Relining the pants, including the fabric, can cost anywhere from $35 to $65. Tapering the leg can cost $30 to $45 for two seams and about $50 to $70 for four seams. Adjusting the waist and/or seat can cost $20 to $35. 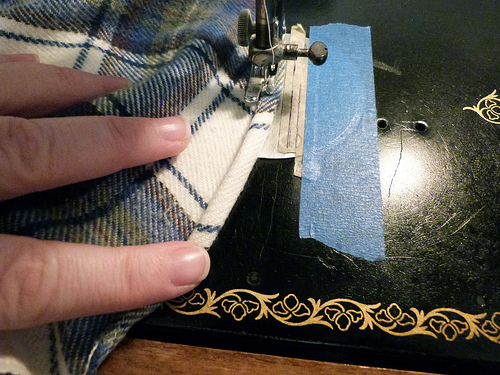 Creating extra pockets can be an additional $7 to $20, depending on the fabric needed. Repairing the belt loops can cost $1 to $5 per loop. Repairing a rip in the clothing can cost $5 to $15, depending on the size. Adding a hem guard can cost $15 to $35. Many Yelp! members chimed in on a forum thread and said the prices could start at $12 and could be more if the pants have pleats. Others said they paid as little as $8 to more than $20. Becky’s Alterations, for example, lists her prices on her website. Here, a regular hem is $12, while an original hem is $18. A take in back seam is $30, while a take in stride is $45. Tailors can perform many alterations, including hemming, hemming with cuffs, tapering the legs, adjusting the waist, replacing the zipper and adding a hem guard. If the paint waist is too large, the tailor can “take in the waist” and slim it down, but if the waist is too small, they can “let out the waist” and enlarge it to fit comfortably. Hemming, which tends to be the most popular job performed, is done if the pant inseam is too long. Tapering will be done if too much room is around the calves and knee area and it needs to be slimmed down. With most jobs, the tailor will measure any part of your body that you want to be altered, and from there, he or she will alter your pants, according to your specifications or their recommendation so they fit perfectly. Most tailors will be able to know what to alter so you’re happy with the results. This process can usually take anywhere from two to five days, depending on how busy they are. Expedited work that has to be done within 24 hours will usually cost more depending on how busy the schedule is. If you don’t know where to look, consider going to the retailer you purchased the pants from and see if they can offer a recommendation. Sometimes, they may have an in-house person or may be able to point you in the right direction. Check reviews online before settling on a tailor. If you don’t have anyone to talk to, Yelp can show you what people like and don’t like about the tailor they had used. When choosing any tailor, pay close attention to how long they have been doing it, especially if working with a valuable pair of pants. Money Crashers says you should look for someone who works with that specific garment brand to make sure you can use someone how to work with any alteration request. Visit a tailor in person and look at what they are doing right now. Pay close attention to the work to see what kind of work they do. The stitches should be nice and even, no puckering out, and the hems should be even, making it next to impossible to tell where the alteration even took place. Some retailers, such as Nordstrom, offer a significant discount on altering services if you purchase the clothing from them. See if the retailer you purchased from offers alteration services at a discount. Usually, higher-quality clothes are worth altering. If you purchased a pair of pants for $45 and are paying $25 to hem them, it may make sense to invest the $25 into a new pair of pants that fit outside the box. Cheaply made clothes won’t last long when compared to a higher-quality brand pair of pants made from a durable material.